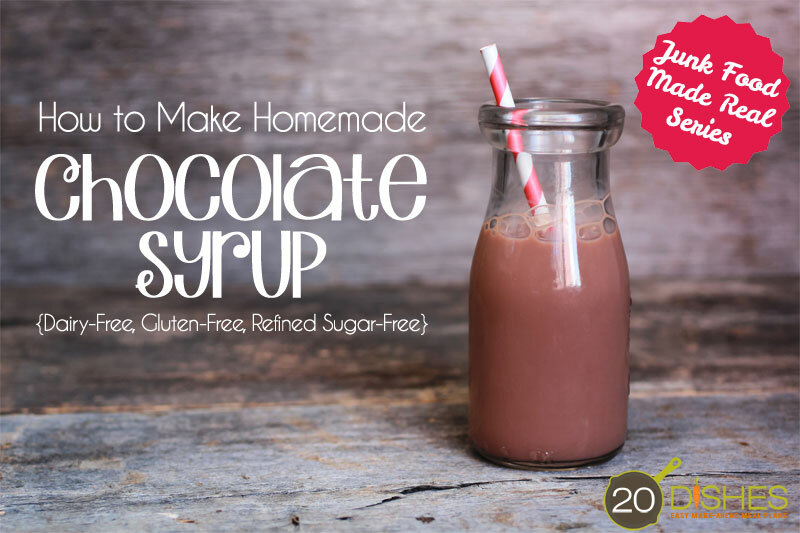 Yep, just like the classic Hershey’s® or Nesquik® syrups that so many people are familiar with. How many people grew up drinking chocolate milk made with store-bought chocolate syrup? Believe it or not, I never did, as my mom was feeding me real food from day one and refused to have junk food in the house at all. But, let me tell you. If I got the chance to go to someone’s house and have chocolate milk made this way, you better believe that I partook!? Making your own chocolate syrup at home is actually pretty easy. It allows you to use real food ingredients and adjust the final taste to suit your specific needs. Plus, the taste is so much richer and more flavorful (in my opinion) than the store-bought stuff. You can watch my full Junk Food Made Real video below, and then click here to get the recipe. No printed recipe? No time to watch videos. Hi Calle! Thanks for stopping by! All you have to do to get the full recipe is click on the link that says “Read the Full Blog Post and Get the Recipe Here”. It’s right below the video. 🙂 Hope that helps! !